I hope everyone had fun during the Labor Day weekend! I went to Vegas with my family this weekend and ate a LOT of food, as you can see on my twitter. Guess what this week is?? Personally, I do not drink tea because I don`t really like the taste of it. 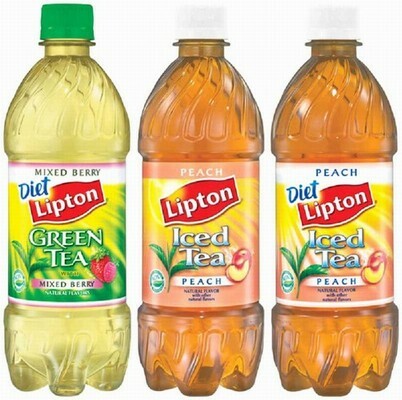 I do love Lipton iced tea and Milk Tea with boba. I drink milk tea so often, I think it`s almost an addiction. Some months, it`s once a week AT LEAST. While other months, I go 2 weeks at a time without drinking milk tea boba, even though I`m always craving for some. But yeah, that`s all the tea I`ll drink. However, I LOVEEE green tea flavored desserts and I have tried several dessert recipes using matcha powder--even though this stuff is EXPENSIVE. I have tried 2 different brands and they are both awesome. If you`ve never heard of matcha/green tea powder before, it`s like cocoa powder, but green tea flavor instead. It`s not the same as the powder to make the tea (I believe). This is the one I`m currently using. I`m lucky enough to have Japanese supermarkets where I live, so I buy them there. Back to this FABULOUS ice cream... IT`S DELICIOUS. Definitely one of my favorites homemade ice cream so far! 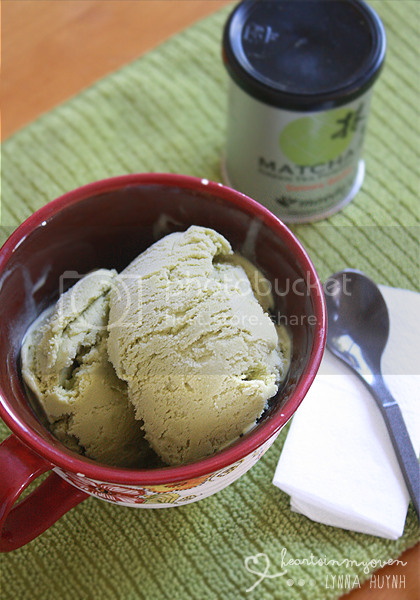 It`s creamy and has that wonderful green tea flavor. I followed the recipe exactly from Annie`s TOTALLY awesome blog: Annie Eats. The one problem I did encounter was when my green tea powder didn`t dissolve completely. I had to strain the cream mixture twice and threw out quite a bit of powder. I think next time, I`m just going to add it into the cream mixture when it`s still on the stove. I love green tea and green tea ice cream! Gonna have to try this once I find some matcha powder. 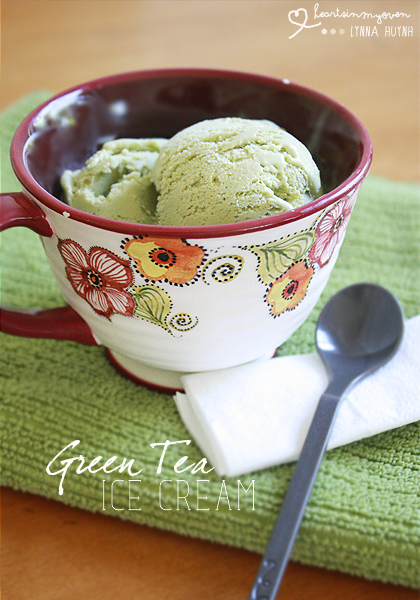 I don't drink green tea so I can't have this.. but every time I see green tea ice cream, I always want to try it! :) Looks beautiful. Aww...why not? 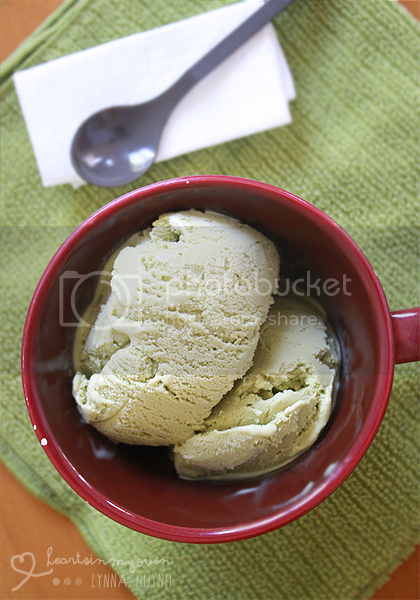 I don`t drink tea either, but I can't help myself around green tea ice cream! I need a damn ice cream maker. I just don't have the space for it! I have a bread machine that I never use...I think that's about to get thrown away to make room. I'm not a big tea drinker, either, but I do love green tea flavored treats. Get one! ;) You won`t regret it & I can see all the yummy flavor you`ll make! Matcha green tea :- Buy Best Matcha Tea- If you are health conscious then find here Matcha tea including White Matcha, Black Matcha, Royal Matcha, Flavored Matcha & Sugar Destroyer Matcha. Know more about Matcha green tea & Powdered green tea for health benefits withredleaftea.com an online supplier of Matcha tea.